Serena Hotel is one of two Hotels in Rwanda ranked top with 5-stars. In 2007, Rwanda joined the East African Community (EAC) and in order to raise the visibility and awareness on standards of tourist products in EAC, Rwanda has started to rate its hotels. To be rank, accommodation and restaurant establishments must meet essential criteria 100 per cent as covered in the EAC standards Criteria. 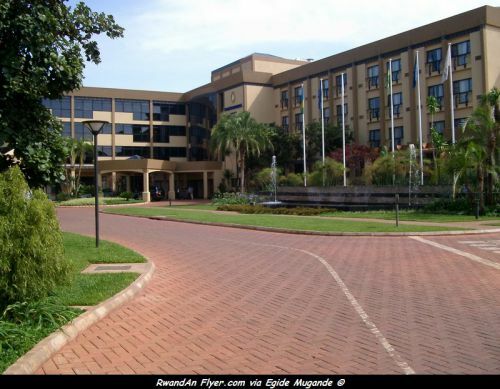 At least 60 Rwandan hotels and other hospitality facilities are expected to be graded during the second phase of hotel classification and grading exercise set to take place this month, the Rwanda Development Board (RDB) has revealed. Emmanuel Werabe, the head of tourism and quality assurance at RDB, says the classification will not only help the country to meet the regional standardization, but also facilitate industry operators in their marketing. "When a visitor wants to come to Rwanda for the first time, he can browse looking for a hotel with such stars depending on his preference, but it's not easy if there is no classification," pointed out Werabe. The exercise is not optional, but obligatory across the East African Community, Werabe noted, adding that the exercise is conducted in order to raise the visibility and awareness on standards of tourist products in EAC as it is envisaged by the EAC treaty. According to Article 115 of the treaty concerning tourism, "the Partner States shall establish a common code of conduct for private and public tour and travel operators, standardize hotel classifications and harmonize the professional standards of agents in the tourism and travel industry within the Community." With the EAC standardization on hotel ranking, the ideal is that five-star hotel in all member states meet exactly the same criteria in various areas. Werabe noted that all classifiable accommodation and restaurant establishments must meet essential criteria 100 per cent as covered in the EAC standards Criteria for classification of hotels, restaurant and other tourist facilities as a prerequisite for classification. "The classification is not about buildings, but quality service," noted Werabe. The essential items inspected include valid operating licenses, drainage system, room designation, safe deposit service whereby hotel guests may hand over their valuables to management for safekeeping, wash rooms, health/medical examination and emergency evacuation among others.